Posted 16 April 2015 & filed under 1930s, Places and spaces, Streets. 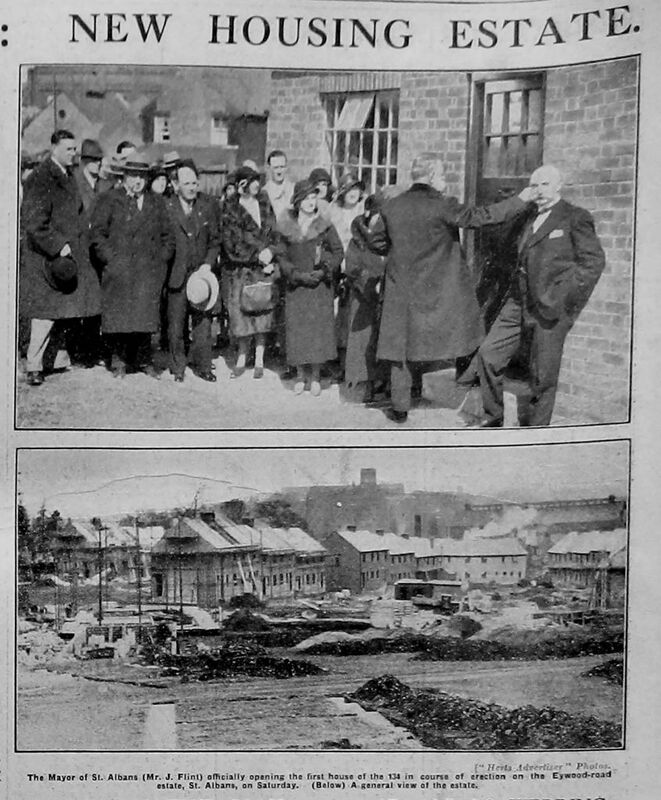 In 1931-2, subsidised by the government, the Workman’s Housing Association built 134 houses where there was once a footpath leading up the hill from Eywood Road. The estate was called the Eywood estate which later became part of St Julian’s estate and the roads were called Doggetts Way and Wilshere Avenue. The houses all had three bedrooms, a bathroom and fair sized gardens and were built of dull red brick with tiles to tone and partly stuccoed. The rents when they were first built were eight shillings and sixpence per week for the parlour type and six shillings and sixpence per week for the non-parlour type. The houses were not all rented, some were built for sale. Wilshere Avenue was named after the Wilshere family who were the owners of the Eywood Estate and had been since the early 19th century. At the time the road was built, the owner was Alice Augusta Wilshere. John Doggett was a mayor of St Albans in 1675 so Doggett’s Way is probably named after him. There was also a field called Doggett’s Field which was at the top of the hill overlooking the gasworks – the grassy area by the path between Trumpington Drive and Maynard Drive, where the line of poplar trees is now. The mayor of St Albans, Mr J. Flint, performed the opening ceremony in 1932. Hi Derek, they did, and to the best of my knowledge, Mum who was Theresa and two sons, Kevin and Graham are still there. Tony, my friend died a couple of years ago, and David, many years ago I believe. They emigrated about 1970. Tony returned to train in the Civil Service at 18 but lived in Croydon. I think they did return because Mr & Mrs 25th was held locally in 1977 but I lost contact after that. Remember their place in Wiltshere Ave very well.